Unless you are brain dead, and I believe you are, big pharma knows it cannot control or cash in on cannibis or hemp oil cures because people can basically make it themselves at home. They are making billions by keeping people addicted to opioid drugs and relying on chemo, even though they know it kills people. They don’t want a cure. A cure would mean certain death for them. List me among the brain dead. People will continue to develop cancer with or without a cure. Pharmaceutical companies would cash in big if they were to develop a cure. A cure is not the same as a vaccine. - Job growth in January shattered expectations, with nonfarm payrolls surging by 304,000, the Labor Department says. - Economists surveyed by Dow Jones had expected payrolls to rise by 170,000. - There were revisions. December’s big initially reported gain of 312,000 was knocked all the way down to 222,000, while November’s rose from 176,000 to 196,000. - The unemployment rate ticked higher to 4 percent, a level where it had last been in June, a likely effect of the shutdown, according to the department. December’s big initially reported gain of 312,000 was knocked all the way down to 222,000, while November’s rose from 176,000 to 196,000. On net, that took the two months down by 70,000, bringing the three-month average to 241,000. That’s still well above the trend that would be common this far into an economic expansion dating back 9½ years. Among individual groups, the unemployment rate for Hispanics jumped to 4.9 percent from 4.4 percent in December. The rate for African-Americans rose to 6.8 percent from 6.6 percent while Asians saw a decline to 3.1 percent from 3.3 percent. The rate for whites was 3.5 percent, a notch higher than December’s 3.4 percent. A Bureau of Labor Statistics official estimated that the shutdown had “no discernable impacts” on the ability to make estimates, though there was some effect on the numbers otherwise. The household survey’s level of unemployed increased by 241,000, or nearly 4 percent, to 6.5 million, helping to push the unemployment rate higher. The survey’s level of those counted as employed tumbled by 251,000 to 156.7 million. The department uses its establishment survey, which contacts businesses, to formulate the headline monthly job gains. Professional and business services were up 30,000 and manufacturing increased by 13,000, bringing that sector’s 12-month total to 261,000. Ocasio-Cortez said, "Unemployment is low because everyone has two jobs. You're not brain dead. There is no cure for cancer. There are over 100 types of cancer. Some respond well to treatement, while others do not. A cure has been defined as surviving 5 years without recurrence. If you get lung cancer or malignant melanoma, you're in trouble. Pay no attention to the nonsense you've read here in other posts. You're not brain dead. There is no cure for cancer. There are over 100 types of cancer. Some respond well to treatement, while others do not. A cure has been defined as surviving 5 years without recurrence. Medical Science is advancing exponentially. imagine the advances in medical science. I would be a newsrake poster...forever. --You sure you'd wanna got that route, hook? It means you'd be spending eternity with dalibrul. dalibrul and libass don't have brains. Of course, you need not concern yourself with cancer, as you are insured and you have prayer. --Hope has nothing to do with it. Prayer does, however, and I'm fully capable of applying that. --I thought you were speaking about it as a problem for society as a whole. While that may not be a concern for you, it certainly is for me. And I've seen enough people die from it to that it's a nasty way to go. All of the insurance and prayers a person can muster won't change that. Stocks surged on Friday amid increasing hopes for a U.S.-China trade deal as equities posted another solid weekly gain. The Dow Jones Industrial Average jumped 443.86 points to 25,883.25 as J.P. Morgan Chase and Goldman Sachs outperformed. The S&P 500 gained 1.1 percent to close at 2,775.60, led by the energy and industrials sectors. The Nasdaq Composite advanced 0.6 percent to end the day at 7,472.41. Energy shares were boosted by higher oil prices. West Texas Intermediate futures rose 2.2 percent to $55.59 per barrel. Bank stocks also rose broadly. The SPDR S&P Bank ETF (KBE) climbed 2.25 percent. Goldman Sachs, Morgan Stanley, J.P. Morgan Chase, Citigroup and Bank of America each advanced 2.54 percent or more. The 30-stock Dow's eight-week winning streak is its longest since the one ending Nov. 3, 2017. The Nasdaq also posted its eighth consecutive weekly gain. The S&P 500, meanwhile, closed its seventh weekly gain in eight. The indexes rose at least 2.4 percent each this week. "The market is just getting rational again and simply rebounding from an irrational sell-off last fall," said Craig Callahan, president at Icon Funds. He said the market was brought down late last year by fears of a Chinese economic hard landing, worries that a slowdown in China could spread around the world and concern over tighter Federal Reserve monetary policy. "We think this is just those fears subsiding and the market being rational again," said Callahan. "The China trade talks are helping with the first one." Chinese President Xi Jinping said trade talks between the U.S. and China will continue next week in Washington. This comes after a U.S. trade delegation led by Treasury Secretary Steven Mnuchin and U.S. Trade Representative Robert Lighthizer was in Beijing this week. China and the U.S. are trying to strike a trade deal before an early March deadline. If a deal is not reached by then, additional U.S. tariffs on Chinese goods could take effect. President Donald Trump, however, is considering pushing back the deadline by 60 days to give negotiators more time to come up with a deal. "If there is a resolution, you've got a lot of market participants who are anticipating a big pop-up. That's why we continue to see money into the equity market as well," said Daniel Deming, managing director at KKM Financial. The moves Friday come after the Dow and S&P 500 fell on much weaker-than-forecast retail sales numbers. Data from the Commerce Department showed U.S. retail sales contracted by 1.2 percent in December, the largest monthly fall since September 2009. On the data front Friday, industrial production for January fell 0.6 percent. Economists, however, expected an increase of 0.3 percent. Consumer sentiment data for February, meanwhile, topped expectations. The Dow posted its ninth consecutive week of advances, its longest weekly winning streak in nearly 24 years, as investors continued to digest commentary surrounding progress toward a U.S.-China trade deal. The Dow (^DJI) closed at 26,031.81 points, having climbed 0.7%, or 181.18 points, by the end of Friday’s session. This was the first time the index crossed 26,000 points since November 9, and its nine straight weeks gains marked the longest streak since a 10-week run between March and May 1995. The S&P 500 (^GSPC) rose 0.64%, or 17.79 points, with tech stocks leading advances as the index posted its fourth consecutive week of gains. The Nasdaq (^IXIC) rose 0.91%, or 67.84 points, and posted its ninth straight week of advances, tying for the longest weekly winning streak since May 2009. 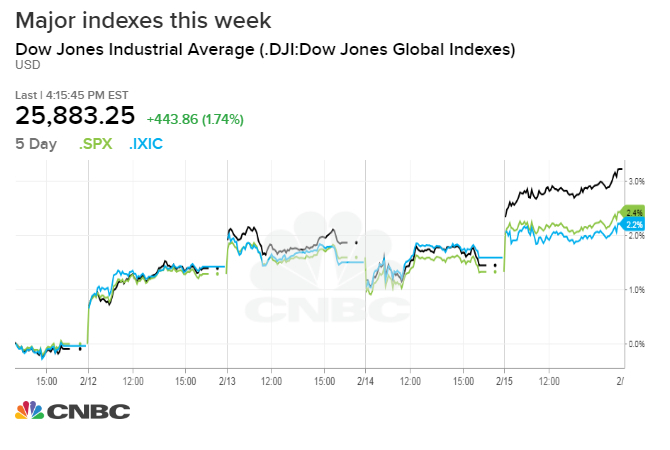 Each of the three major indices surged to new 2019 highs during Friday’s session. The S&P 500 rose as high as to 2,794.2 points, the highest level since December. The Dow and the Nasdaq each rose to their highest levels in more than 3 months, touching 26,052.9 points and 7,527.54 points, respectively, at their intraday highs. Trump met with Chinese Vice Premier Liu He in Washington, D.C. Friday afternoon in the latest round of discussions as the U.S. and China attempt to come to a deal on trade. Trump told reporters Friday that discussions have been going well, but “who knows” whether a final deal will emerge, according to a CNBC report. Trump also said he expects to meet with Chinese leader Xi Jinping in the near-term, according to a Bloomberg report. Talks have been under way for more than a month between delegations from the two sides, and Trump and Liu previously met in late January for an earlier round of talks. Earlier this week, reports that the U.S. and China had begun carving out memorandums of understanding to underscore a final trade deal helped boost optimism for a resolution. The rate of tariffs on Chinese-made goods is set to increase to 25% from 10% if discussions are not completed by March 1. However, Trump has signaled recently he would consider extending this deadline. Aside from reacting to additional stimulus from Federal Reserve commentary and corporate earnings results, the three major domestic indices so far this year have shifted largely in lockstep with the corresponding optimism or pessimism officials have telegraphed for a China trade deal. China trade discussions aside, other geopolitical headlines Friday also pressured stocks. Bloomberg News reported Friday that the European Union would pursue retaliatory tariffs on products from companies including Caterpillar (CAT) and Xerox (XRX) if Trump imposes automotive tariffs on the EU. This follows the release of a Commerce Department statement Sunday saying that it had completed an investigation into the effect of imports of automobiles and parts on U.S. national security. While the results are not yet public, they could advise for the imposition of 25% automotive levies, which was the rate Trump had considered when he first requested the study last May. Throughout the day, a parade of Federal Open Market Committee members whose monetary policy inclinations span the spectrum from dovish to hawkish delivered remarks. Speakers included Atlanta Fed President Raphael Bostic, New York Fed President John Williams, San Francisco Fed President Mary Daly, Vice Chairman Richard Clarida, St. Louis Fed President James Bullard, Philadelphia Fed President Patrick Harker and Vice Chairman Randal Quarles. Page created in 1.398 seconds with 30 queries.